Our first 2007 calf was born sometime between last night's and this morning's chores. For any non farmers out there chores are what we call jobs that get done morning and night every day like feeding, watering, moving livestock (milking for dairy farmers) and are usually like bookends for the rest of the days' work. When I fed the cows their hay last night I checked to see if any of them were thinking about having their calves soon and didn't see anything. 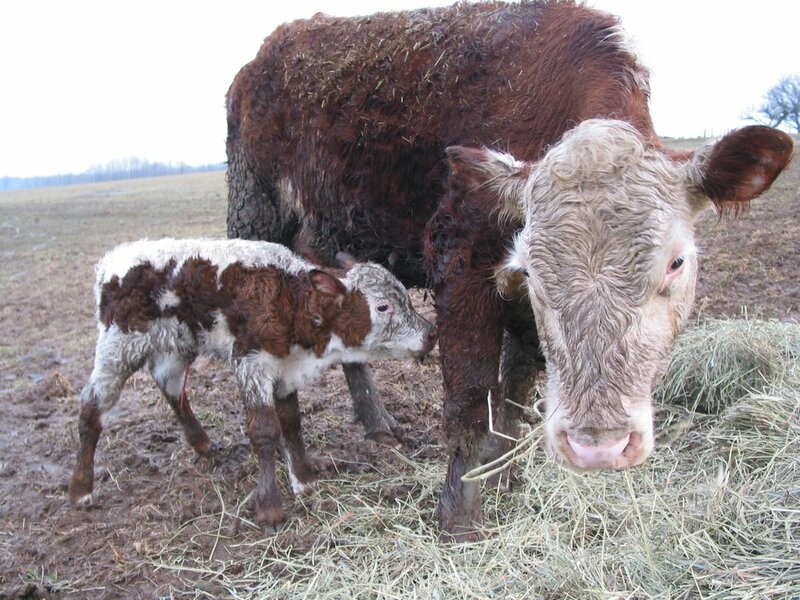 Part of our philosophy on raising cattle is that they should be able to have their calves without any help from us. I have heard some people say that they go on vacation when their cows are calving and when they get back what they have left is the cows and calves who are the fittest. I think that is a little extreme, and I certainly try to keep a close eye on them during calving time, but I probably wouldn't re-breed a cow that had a really hard delivery. But anyhow, this heifer had her calf without incident and the calf (a heifer) is up and eating and frisking around. I hope the other 15 do as well. No, its not that kind of streak. But it is about as attractive as an overweight frat boy running through the mall in the buff. A couple of weeks ago we began a pretty interesting streak of bad luck. Here's the scorecard so far. 93 Dodge Caravan Transmission- Terminal. Anybody want to buy a minivan with a bad transmission? Blaze, 14 year old horse we board here- Got a bad cut on right hock. Had vet in. Was making progress. 3 days later colicked. Had vet in, who determined there was nothing that could be done to help her short of a 2 hour trailer ride to Cornell and a very expensive, doubtfully successful surgery. The owner, vet, and I all agreed she should be put down. Well- Our well is in a pit that is like a shallow well with a roof over it. Because it is below ground level there is a constant trickle of water into it which drains through a pipe into the pasture down the hill from the well. The cows got to stomping around the end of the pipe and ended up burying it with mud. I didn't notice it until our water quality took a nose dive. All of a sudden our water was kind of green and smelled like mold. When I went and looked into the well pit there was 2 feet of water in there, which then flowed right into the drilled well. It took a half day in a snowstorm to get the pipe opened up, the pit drained, and to shock the well with bleach. Adams Parents Car- Our friend Adam came to visit for the weekend from Manhattan. He borrowed his parents Lexus to get here. It is rear wheel drive and has no snow tires, so it got stuck in the snow in our driveway as he was trying to start for home. Since I didn't have the plow on the truck I opted to clear the snow with the front end loader tractor. As I took my first pass with the tractor, I caught the bucket on a high spot in the driveway, which burst a hydraulic hose. Adams' parents' car was sitting right there with the window open, and virtually every drop of hydraulic oil landed on and in the car. My Parents Car- We borrowed a car from my parents because the two cars that we own are inoperable. Last night the Mrs called from Tunkhannock. The car wouldn't start. She ended up calling AAA, who sent out the guy who towed our Camry twice. He got the car started, which seems to have an electrical problem. She got it 3/4 of the way home before the battery drained completely, the lights dimmed, and it stalled. Luckily she was able to get it off of the road, since she had no lights and it was snowing pretty hard and visibility wasn't great. Also she had just enough cell phone service that I was able to hear where she was, and that the car was dead. So that car got towed. So that's where we are at this point. The whole thing is starting to be pretty funny really, and gives us plenty of opportunity to guess what the next major malfunction will be. Since this is largely an automotive manurestorm, coupled with the fact that my wife had to take our 20 year old farm truck to work today, my money is on the truck not making it back home under its own power. The real fortunate part of this streak is that no people have been hurt other than financially. I'll be sure to let you know what the crisis du jour is once I know what it is. A hose did burst in the pig nite lite last night flooding part of their pen, but that's not really of the scale it needs to be to count. 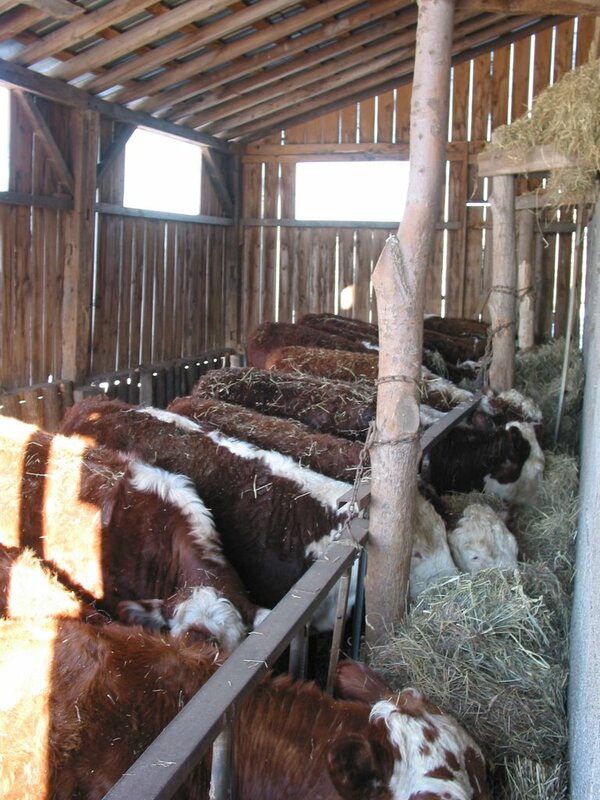 During the winter we feed the cows in the cow shed. This is a shed we built on to the west side of our old bank barn about 5 or 6 years ago. It is 40'x16' and is completely open on the south side. This is a sort of freestall barn setup, where they can go inside or outside as they want to. On mornings like this, when it is 0 degrees and windy, but bright and sunny the attributes of this setup really shine. The cows sit in out of the wind, in the full sun, on a warm composting 3 foot dry bedding pack. They almost smile while they chew their cud. Their are feeder gates the length of the shed, about 2 feet from the old barn wall. 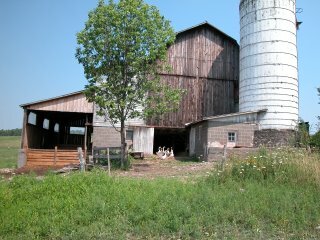 Because the shed is built onto the barn where the hay is stored it is very easy to throw the hay down behind the feeder gates. These gates are welded together out of old dairy barn stantions and channel iron, and are easy to raise up as the bedding pack gets higher during the course of the winter. We also keep adding bedding material to keep the cows clean and dry, as well as to maintain the right carbon to nitrogen ratio of about 20 to 1. When this ratio is right the carbon acts like a sponge to absorb the nitrogen from the cow manure and urine. This stabilizes the nitrogen which keeps it available for fertilizing the fields during the growing season. It also reduces odors and the possibility of ground water and stream contamination. After we move the cows onto pasture we like to move pigs onto the bedding pack to aerate it, which speeds up the composting process. After it is composted we move the pigs back out and clean out the shed with the front end loader, loading it into the manure spreader, which spreads it evenly across the pasture and hay fields. We got a couple of indications that Clodhopper Farm is starting to show up on some radar screens this week. 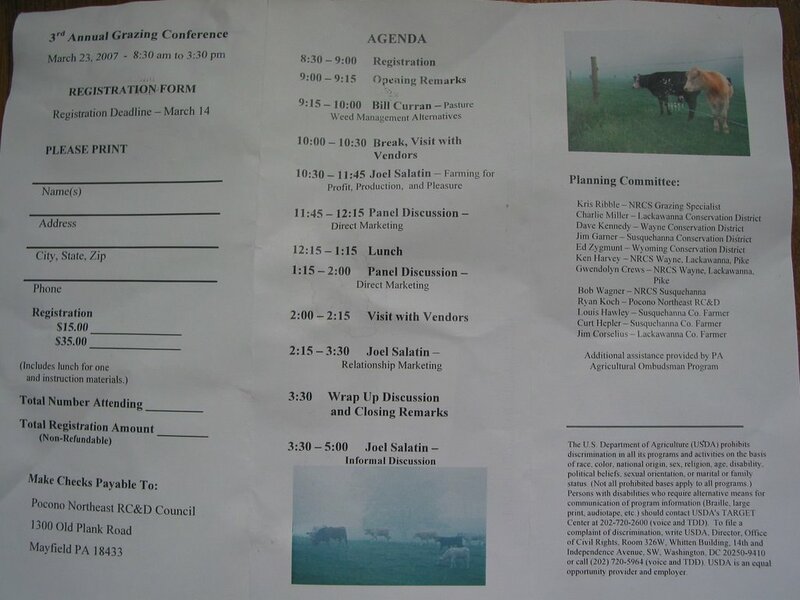 The first was being asked to be a panelist at the 3rd annual NEPA Grazing Conference which will focus on direct marketing. This should be pretty interesting because I think we are really only into mile 2 of the marketing marathon, so I guess I'll be able to carry all my wisdom in on one trip. 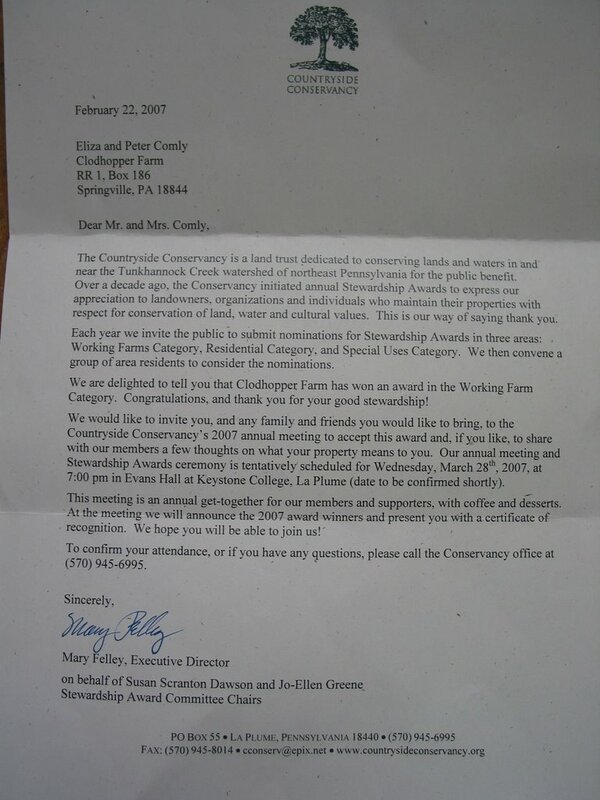 A couple of days later we got a letter informing us that we had won a stewardship award from a local group called the Countryside Conservancy. Last fall a car pulled into the driveway with three women in it. 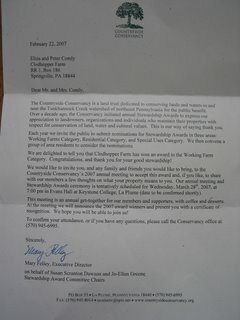 At first I thought it was an egg customer but it turned out to be the Stewardship Award Committee from this organization. They said they like to make surprise visit to the nominated places so they can see what is really going on there. Anyway, my girls and I took them on a little farm tour and I guess that our farming methods met with their approval.